“Four guineas, cash down,” replied the tailor. The man paid the money; then the tailor deliberately folded up the cloth, put it away, took down another roll that was pre-eminently unsatisfactory and spread it out before the man. “But your best is not my best,” argued the man. “Nevertheless you must be satisfied,” said the tailor. By this time astonishment had given place to annoyance. 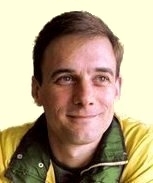 “I have paid for the suit, therefore I will choose the material,” retorted the man hotly. 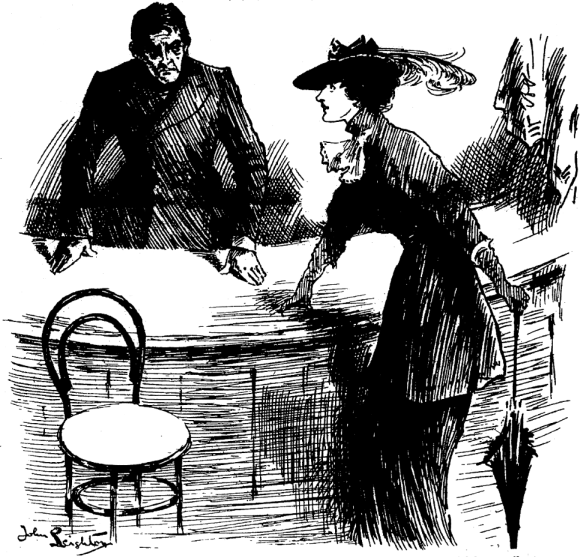 Thereupon the tailor got angry and declared he would stick to the money whatever happened. Naturally the man cried out against this injustice, and made every effort to obtain that which was his by right, whereupon the tailor made such a hullabaloo that the police rushed in and marched off to prison — the man! Ridiculous? Of course it is. Impossible? Oh, dear me, no; this sort of thing happens daily. Just or Unjust? 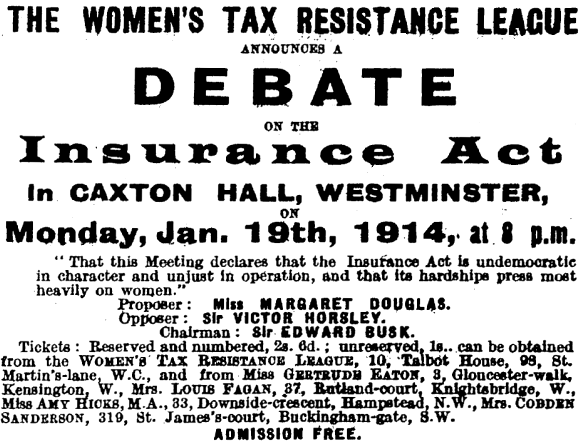 — The much-discussed Insurance Act is to be yet more discussed, and a most interesting evening is assured on Monday, January 19 , when the Women’s Tax Resistance League will hold a debate on the subject at the Caxton Hall at 8 p.m. Miss Margaret Douglas will maintain that the act is undemocratic and presses unjustly and heavily upon women; Sir Victor Horsley will oppose, and Sir Edward Busk will preside. The Tax Resistance League has arranged many stimulating gatherings, and the coming one will justify its well-earned reputation.